This property is truly unique. This award-winning, newly renovated building is located on a quiet residential cul-de-sac, surrounded by extensive grounds and backing onto Northwood Park. Northwoods Village is also conveniently located to a Community Centre, day care centres, schools, supermarkets, pharmacies, restaurants, shopping and more. 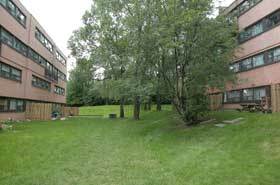 It is also close to York University, TTC and provides easy access to Highways 401 and 400. The buildings’ features include controlled access, security cameras, elevators, laundry facilities and both surface and underground parking. Our over-sized suites are freshly painted with refinished hardwood floors and include, modern kitchens and appliances, plenty of kitchen cabinet space and upgraded ceramic bathrooms. Aside from one bedroom suites, our suites are two-stories, providing you with additional privacy. Large in-suite storage closets are also available in many suites. You will also enjoy our private patios and roof decks overlooking the park. One of the most important features of Northwoods Village are the people. The buildings’ residents are friendly and neighbourly, creating a community atmosphere. In addition, our on-site staff are courteous, respectful and receptive to residents’ concerns. They work with our residents so that our residents can enjoy their homes to the fullest. We are certain you will enjoy being a part of this warm and friendly community.